Strom Thurmond High School (STHS) recently celebrated Millennium Club Day as a way to honor the 62 members in its ranks. 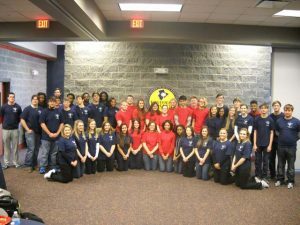 The STHS Millennium Club exists to recognize the efforts of students who have achieved a score of 1000 (Critical Reading plus Math) or better on the SAT or a 21 or better on the ACT. Both the ACT and SAT remain indicators of college freshman readiness. According to the ACT, the average 2013 score in South Carolina was a 20.4. Likewise, South Carolina’s Department of Education asserts the 2013 average score for a public school senior was a 964 (Critical Reading plus Math). Within the Millennium Club, members are additionally recognized for superior academic performance, as evidenced by lofty scores. The 1200s Club students made a 27 or better on the ACT or a 1200 or better on the SAT. The 1300s Club students made a 1300 or better on the SAT or a 29 or better on the ACT, and the 1400s Club students made a 1400 or better on the SAT or a 32 or better on the ACT. Strom Thurmond High School staff and faculty praise the efforts and excellence of these fine young men and women and wish them continued success in their studies.